Gluten Free & Allergy Friendly: Lunch Made Easy: TGIF!! Smile! Lunch Made Easy: TGIF!! Smile! 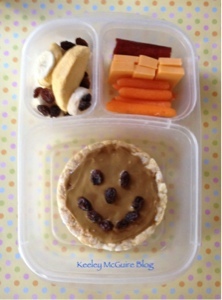 Little Miss has a gluten free rice cake topped with SunButter spread and raisins for the smiley face. Top left is a mixture of raisins, freeze dried bananas, and freeze dried mangos. Little Miss has been lovin' these mangos, btw... So yummy. Top right is baby carrots, colby cheese slices, and a gluten free beef stick. Right, love the smiley face :) Makes me happy seeing one.